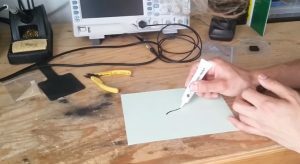 Back in 2009, a small team of students at the Royal College of Art in London, England, began experimenting with a nontoxic conductive paint. That work laid the foundation for their company Bare Conductive, which inspires artists and engineers to take on innovative projects that involve painting circuits. Circuit Cellar travels to Commercial Street in London and interviews Stefan Dzisiewski-Smith and Isabel Lizardi, two members of Bare Conductive. Living on a granite hill during a thunderstorm gave Circuit Cellar founder Steve Ciarcia new respect for Mother Nature. In a classic 1998 article, Steve described how he worked with Circuit Cellar columnist Jeff Bachiochi on a solution to automatically unhook their appliances when large storms hit. An optically isolated pulse transmitter is connected to a low-cost McCallie Manufacturing lightning sensor mounted on a grounded pole on the roof. The energy propagated from the current flow of a lightning strike contains wideband energy. Everything from 100 Hz to 100 MHz is produced. Emissions below 100 kHz travel along the wave guide formed by the earth’s surface and the lower ionosphere. With respect to the earth (ground), the air around the strike becomes charged, and there is a direct relationship between the amount of charge and the distance from the strike. We located a minimum-cost lightning sensor from McCallie Manufacturing. Of the two models available, we chose the LSU2001, which is priced around $50. Simple circuits are also provided for adding a meter or LEDs to monitor live data, or you can connect the sensor through an optocoupler to a PC. Optional software lets you count and graph storm data (providing you wish to keep the PC on day and night). The hits-per-minute converter also generates a “lightning alarm” output. This signal causes the circuit to physically disconnect the AC power, cable, and phone-line connections to the protected appliance. 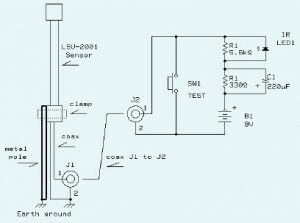 The manufacturer suggests mounting the LSU2001 on a well-grounded metal pole. The higher above ground it’s mounted, the farther away you’ll be able to detect lightning strikes. 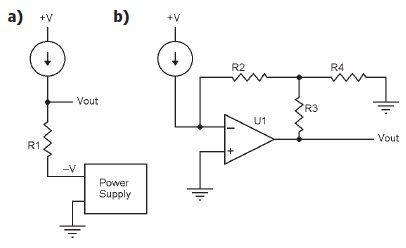 Sensitivity is related to the differential charge between the air and ground—about 0.15 V/m. Put it twice as high, and it will be twice as sensitive. Read the entire article from Circuit Cellar 90, 1998. A “dead man’s switch” (abbreviated here as DMS) is a very useful device for applications where the effect of forgetting to turn something off ranges from a mild annoyance to costly or dangerous consequences. We first learned about the DMS from a locomotive engineer, who explained vividly that an engineer is supposed to press a button every minute to keep the locomotive going, otherwise the machine stops. Less “dramatic” applications include turning off lights or other equipment after a period of time. 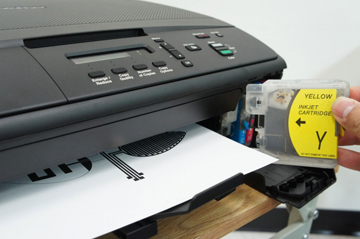 The ideal DMS provides several minutes of “on” time, requires no programming, external controls, additional power supplies and no modifications of the existing equipment. In effect, no changes should occur in the standard operating procedures of using the equipment. To reset the timer from “off” back to “on,” it is desirable to either use a button or just cycle the power. Ironically, a multitude of electronic timers available online or at home improvement retail stores are highly over-engineered. These timers either require programming of specific date-times to be “ON” or have very long pre-sets, require changes in equipment wiring, etc. This article presents a DMS design that has been tested and currently in use in two different systems. One is controlling a UV source and another is controlling a hydrogen gas line valve. If someone forgets to turn off the UV source, the repairs are costly. When it comes to forgetting to turn off hydrogen, a violent explosion may happen! The DMS works as follows. First, there are no microcontrollers—just plain physics. Capacitors C1 (bipolar, electrolytic) and C2 make a voltage divider (see Figure 1). Note this timer was originally designed for the European voltage; however, it is very simple to recalculate the capacitor divider for the US voltage. 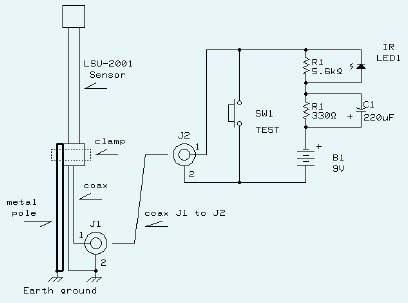 Figure 1: This is the timer schematic. The Reset button S1 is optional. The voltage is rectified by a bridge and smoothed by C3. The voltage on C3 is approximately 13 V. When the timer is powered on, both capacitors C4 and C5 are quickly charged each to a half of the supply voltage. FET is turned on and relay is engaged. At the same time, the charge begins a slowly redistribution between the capacitors, with C5 discharging via R3 and C4 further charging. 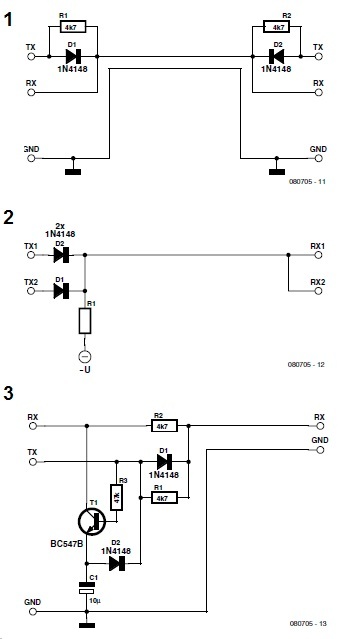 Note that diode D1 is not conducting. When C5 is discharged enough, FET is turned off. This causes the relay to disengage. The timer will continue to be in this state as long as the power is provided, because C4 is effectively blocking any current flow. If the power is removed, D1 opens up to discharge C4 via R2. Remember: C5 is already discharged. Thus, the timer is reset to its initial condition. In addition, a manual reset switch S1 is added in case if it is more convenient to reset the timer by pushing a button rather than briefly disconnecting the mains power. With the indicated components, the “on” time is for approximately 6 minutes. Changing C4 and C5 adjusts the “on” time. Our hydrogen valve control system uses capacitances of 30 µF each, resulting in approximately 25 minutes of “on” time. Note that the capacitances of C4 and C5 must be the same. Dr. Alexander Pozhitkov has an MS in Chemistry and a PhD in Genetics from Albertus Magnus University in Cologne, Germany. For 12 years he has been involved with interdisciplinary research relating to molecular biology, physical chemistry, software, and electrical engineering. Currently, Dr. Pozhitkov is a researcher at the University of Washington, Seattle. His technical interests include hardware programming, vacuum tubes, and high-voltage electronics. Hans-Joachim Hamann is a staffer at the Max Planck Institute for Evolutionary Biology. Once I connected a battery up to a DSP in the wrong “direction,” thereby destroying the DSP. That incident drove home the necessity of “suspenders and belt” design. After the accident, my colleague and I added a diode to the circuit to make it impossible to repeat that mistake. Nowadays, when I teach elementary electronics courses, I generally mention the diode bridge as a way to make it possible to connect up a battery in either “direction” without endangering the electronics to which the battery is to be connected. Question 1—A divider is a logic module that takes two binary numbers and produces their numerical quotient (and optionally, the remainder). The basic structure is a series of subtractions and multiplexers, where the multiplexer uses the result of the subtraciton to select the value that gets passed to the next step. The quotient is formed from the bits used to control the multiplexers, and the remainder is the result of the last subtraction. If it is implemented purely combinatorially, then the critical path through all of this logic is quite long (even with carry-lookahead in the subtractors) and the clock cycle must be very slow. What could be done to shorten the clock period without losing the ability to get a result on every clock? Answer 1—Pretty much any large chunk of combinatorial logic can be pipelined in order to reduce the clock period. This allows it to produce more results in a given amount of time, at the expense of increasing the latency for any particular result. Divider logic is very easy to pipeline, and the number of pipeline stages you can use is fairly arbitrary. You could insert a pipeline register after each subtract-mux pair, or you might choose to do two or more subtract-mux stages per pipeline register You could even go so far as to pipeline the subtracts and the muxes separately (or even pipeline *within* each subtract) in order to get the fastest possible clock speed, but this would be rather extreme. The more pipeline registers you use, the shorter the critical path (and the clock period) can be, but you use more resources (the registers). Also, the overall latency goes up, since you need to account for the setup and propagation times of the pipeline registers in the clock period (in addition to the subtract-mux logic delays). 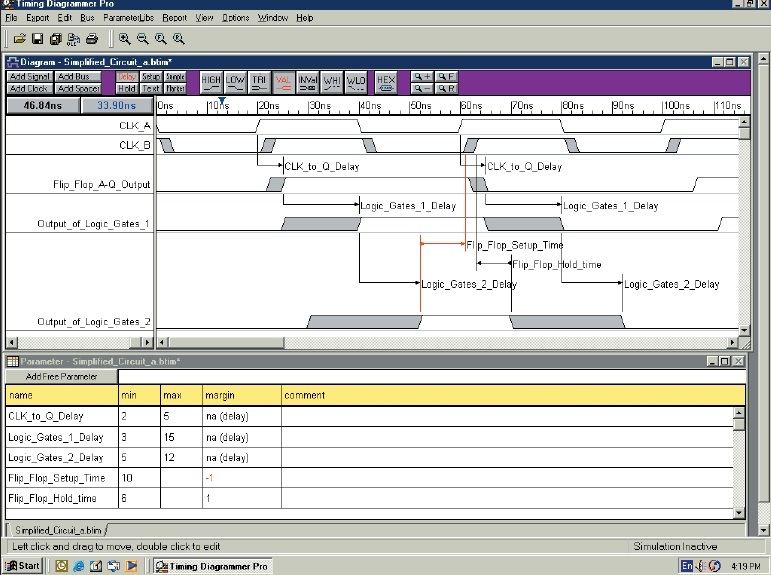 This gets multiplied by the number of pipeline stages in order to compute the total latency. Question 2—On the other hand, what could be done to reduce the amount of logic required for the divider, giving up the ability to have a result on every clock? Answer 2—If you don’t need the level of performance provided by a pipelined divider, you can computes the quotient serially, one bit at a time. You would just need one subtractor and one multiplexer, along with registers to hold the input values, quotient bits and the intermediate result. You could potentially compute more than one bit per clock period using additional subtract-mux stages. This gives you the flexibility to trade off space and time as needed for a particular application. However, when he built and tested his filter, he discovered that while it worked fine around 8 MHz, the attenuation at very high frequencies (e.g., >80 MHz) was very much reduced. What caused this? The crystal has a series-resonant frequency based on just Cser and L. It has a relatively low impedance (basically just R) at this frequency. It also has a parallel-resonant (sometimes called “antiresonant”) frequency when you consider the entire loop, including Cpar. Since Cser and Cpar are essentially in series, together they have a slightly lower capacitance than Cser alone, so the parallel-resonant frequency is slightly higher. The crystal’s impedance is very high at this frequency. But at frequencies much higher than either of the resonant frequencies, you can see that the impedance of Cparalone dominates, and this just keeps decreasing with increasing frequency. 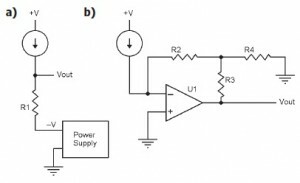 This reduces the crystal lattice filter to a simple capacitive divider, which passes high freqeuncies with little attenuation. Question 4—Suppose you know that a nominal 10.000 MHz crystal has a series-resonant frequency of 9.996490 MHz and a parallel-resonant frequency of 10.017730 MHz. 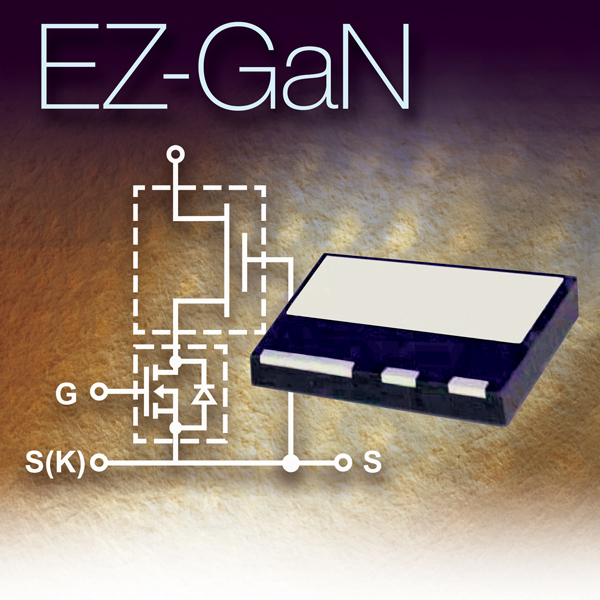 You also know that its equivalent series capacitance is 27.1 fF. How can you calculate the value of its parallel capacitance? I’m in a very rural area and I value the quietness and the view out of the window over my desk. However, there are more farmers than engineers here so there’s not much of a high-tech community! I work out of the house and share an office with my wife, who handles all of my travel and administrative matters. My corner is both lab space and desk. Some of the equipment changes fairly rapidly as vendors send in gear for reviews and evaluation. Ganssle’s desk is home to ever-changing equipment. His Agilent Technologies MSO-X-3054A mixed-signal oscilloscope is a mainstay. The centerpiece, though, is my Agilent Technologies MSO-X-3054A mixed-signal oscilloscope. It’s 500 MHz, 4 GSps, and includes four analog channels and 16 digital channels, as well as a waveform generator and protocol analyzer. I capture a lot of oscilloscope traces for articles and talks, and the USB interface sure makes that easy. That’s pretty common on oscilloscopes, now, but being an old-timer I remember struggling with a Polaroid scope camera. The oscilloscope’s waveform generator has somewhat slow (20-ns) rise time when making pulses, so the little circuit attached to it sharpens this to 700 ps, which is much more useful for my work. 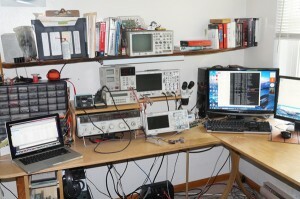 The photo shows a Siglent SDS1102CML oscilloscope on the bench that I’m currently evaluating. It’s amazing how much capability gets packed into these inexpensive instruments. The place is actually packed with oscilloscopes and logic analyzers, but most are tucked away. I don’t know how many of those little USB oscilloscope/logic analyzers vendors have sent for reviews. I’m partial to bench instruments, but do like the fact that the USB instruments are typically quite cheap. Most have so-so analog performance but the digital sampling is generally great. Only barely visible in the picture, under the bench there’s an oscilloscope from 1946 with a 2” CRT I got on eBay just for fun. It’s a piece of garbage with a very nonlinear timebase, but a lot of fun. The beam is aimed by moving a magnet around! Including the CRT there are only four tubes. Can you imagine making anything with just four transistors today? The big signal generator is a Hewlett-Packward 8640B, one of the finest ever made with astonishing spectral purity and a 0.5-dB amplitude flatness across 0.5 MHz to 1 GHz. A couple of digital multimeters and a pair of power supplies are visible as well. The KORAD supply has a USB connection and a serviceable, if klunky, PC application that drives it. Sometimes an experiment needs a slowly changing voltage, which the KORAD manages pretty well. They’re mostly packed away, but I have a ton of evaluation kits and development boards. A Xilinx MicroZed is shown on the bench. 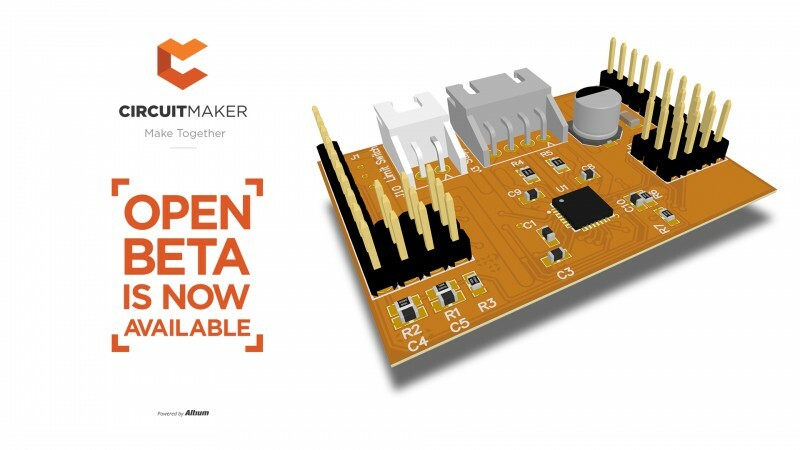 It’s is a very cool board that has a pair of Cortex-A9s plus FPGA fabric in a single chip. I use IDEs and debuggers from, well, everyone: Microchip Technology, IAR Systems, Keil, Segger, you name it. These run on a variety of processors but, along with so many others, more and more I’m using Cortex-M series parts. My usual lab work is either evaluating boards, products and instruments, or running experiments that turn into articles. It pains me to see so much engineering is done via superstition today. For example, people pick switch contact debounce times based on hearsay or smoke signals or something. Engineers need data, so I tested about 50 pairs of switches to determine what real bounce characteristics are. The results are on my website. Ditto for watchdog timers and other important issues embedded people deal with. Ganssle notes that his other “bench” is his woodworking shop. To learn more about Ganssle, read our 2013 interview. The circuit should be designed so that each ammeter displays one of the values Xa, Xb, or Xc. Given that the Xa, Xb, and Xc values represent currents, what kind of circuit analysis yields equations in this form? You get equations in this form when you do mesh analysis of a circuit. Each equation represents the sum of the voltages around one loop in the mesh. What do the coefficients on the left side of the equations represent? What about the constants on the right side? The coefficients on the left side of each equation represent resistances. Resistance multiplied by current (the unknown Xa, Xb, and Xc values) yields voltage. The “bare” numbers on the right side of each equation represent voltages directly (i.e., independent voltage sources). What is the numerical solution for the equations? 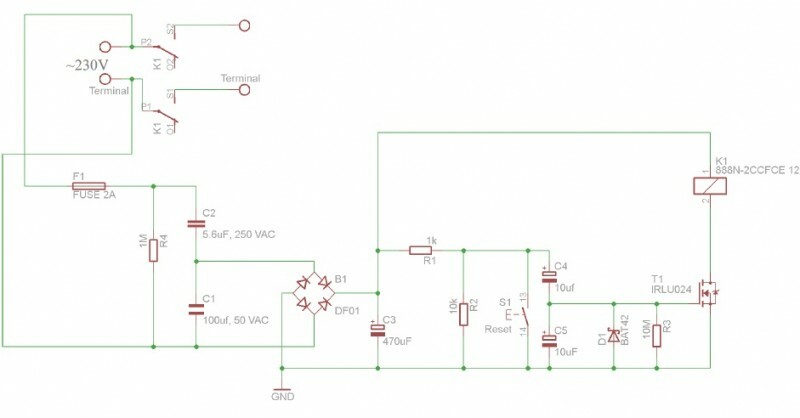 Finally, what is the actual circuit? 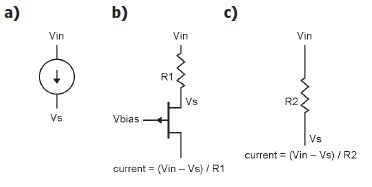 Draw a diagram of the circuit and indicate the required value of each voltage source. The circuit is a mesh comprising three loops, each with a voltage source. The common elements of the three loops are the three 10-Ω resistors, connected in a Y configuration (see the figure below). The values of the voltage sources in each loop are given directly by the equations, as shown. To verify the numeric solution calculated previously, you can calculate all of the node voltages around the outer loop, plus the voltage at the center of the Y, and ensure they’re self-consistent. By loading these nanomaterial-based conductive, dielectric, and sensing inks into the different-colored cartridges of a desktop inkjet printer, 3-D electronics topologies such as metal-insulator-metal (MIM) capacitors can then be created by printing the different inks on top of each other in a layer-by-layer deposition. 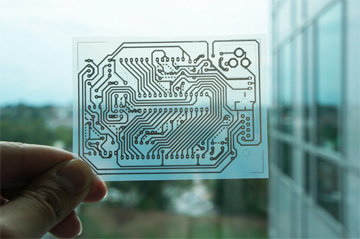 Since printing is a non-contact additive deposition method, and the processing temperatures are below 100⁰C, these inks can be printed onto virtually any substrate, including standard photo paper, plastic, fabrics, and even silicon wafers to interface with standard ICs with printed feature sizes below 20 µm.